A well-stocked pantry makes preparing impromptu dinners much easier. In fact, quite a few classic, one-dish meals like risotto or homemade marinara call for basic ingredients like chicken broth or chopped tomatoes. 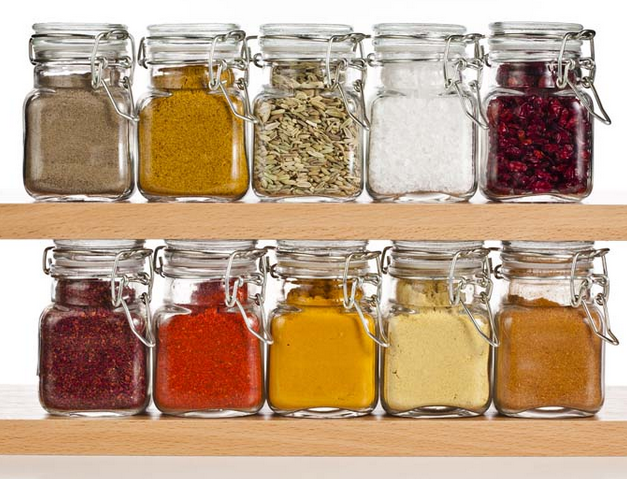 Here are some good pantry basics for fresh, quick dishes. If you have these items on hand, you will always be able to concoct a delicious meal with any simple cut of meat and a handful of vegetables. Think of your pantry as having several “bins” for different types of food. You will want to have a supply of starches, canned vegetables and beans to back up your fresh supply, specialty ingredients, and a supply of excellent sauces and high quality spices. My starch shelf leans heavily to rice: brown rice for every day eating (I even eat it for breakfast sometimes), jasmine rice for curry dishes and stir-fry, and arborio rice for those deeply soul-satisfying risottos. You can also include pasta in your starch collection—linguine, fettucine and spaghetti are all great with impromptu pasta sauces. Penne and rotini work equally well with a pasta sauce or as an impromptu pasta salad with vegetables and olives. Bread and baking products are also useful for quick meals. Dress up a cornbread mix with cheese and peppers and you’ve got a great combo for chili, omelettes or pork chops. Flour, bread crumbs and panko can be used to make all kinds of healthy snacks—one of my favorites is quick-browned onion rings. Just whip one egg, add enough flour to make a stiff dough (like cookie dough), and dial it back with a spoonful or two of water until it’s pancake consistency. Add some spices and a little panko some bread crumbs for crunch, slice a sweet white onion, drop the rings in the batter and coat them, and then carefully saute them until lightly browned in 2-3 tablespoons of canola, coconut or olive oil. Or avoid oil altogether by broiling them for 5-7 minutes in the oven. You can also batter avocados, steamed asparagus, and sweet pepper slices. I like to make my own homemade broth, but I’ve always found it useful to have a ready supply of broths—chicken, vegetable and beef—on hand. You can make an impromptu soup from leftover rice, lentils and vegetables. Make a quick risotto with broth and arborio rice; risotto is a great way to use up odds and ends from the crisper. Canned chopped tomatoes and tomato sauce go into pasta sauces, the crockpot, and make quick bruschetta toppings for bread, meats and omelettes. I always keep a selection of dried and canned beans on hand for bean salads, soups, crockpot cooking and side dishes. I’ve used this quick salad when entertaining: Drain 1 can kidney beans, 1 can black beans, 2 cans corn niblets. Mix with 4-5 sliced green onions and ½ bunch of cilantro, chopped. If you like, throw in some colorful chopped sweet peppers or a few olives. Dress with olive oil and balsamic vinegar. This is a hearty salad that feeds a lot of people! Other canned vegetables that might come in handy are beets, water chestnuts, bamboo shoots, hot peppers. With these ingredients, you can always whip up a stylish salad, pizza, or pasta dish: sundried tomatoes, preserved artichokes, several types of olives, olive oil, balsamic vinegar, chopped garlic, chili oil, Worcestershire sauce (dark and white), hoisin sauce, sesame oil, sesame seeds, and capers. Of course you’ve got to have the trifecta: Sea salt, whole peppercorns, and red pepper flakes. And there are so many variations—Hawaiian pink salt, French grey salt, Tellicherry peppercorns, lemon pepper, garlic pepper. And in the hot family, there’s cayenne, Hungarian paprika, and hundreds of spice blends to tingle your tongue.